(Medical Xpress)—One of the most incredible instruments you might ever get to play with is a fiberoptic imaging wand that you hold against the underside of your tongue. Through a semi-mysterious optical arrangement, the device lets you see your own red blood cells squeezing through tiny capillaries on a screen in front of you—live and in real time. It is now fairly well established that to understand the function of neurons, we need to understand their mitochondria. To be able to watch them inside living creatures in the same way we can now watch our blood cells would be a remarkable advance. Marija Sajic, and her collegues at University College London have now done just that. In a recent paper in Plos Biology, they use their technique to dispel some of the confusion surrounding one of the most pressing issues in neurobiology: what is the effect of spiking activity on mitochondria? On friday, we looked into some of the mechanisms by which spiking activity controls myelination, at least in cultured dorsal root ganglion cells (DRGs). It is difficult to study the full effects of spikes on mitochondrial dynamics in whole cultured nerves because the behavior of interest plays out on a large scale. In humans for example, we could be talking axons of up to meter, in blue whales, several meters. Marija and her group were able to isolate DRG axons in the saphenous nerve of intact mice. The saphenous nerve ennervates sensory cells, including capscacian-sensitive Merkle Disks in parts of the legs. With this preparation, they could activate the specialized dendrite and track mitochondria over long distances. In DRG cells, this dendrite is really an axon, only the spikes that it conducts proceed "antidromically" (toward the cell body) in the tortured nomenclature we still seemingly use even for these uniquely structured, invertebrate-like neural relics. But what is so important about their mitochondrial dynamics? The brain has always been described in terms of the prevailing technology of the day. Descartes concepts of hydraulic nerves survived up through the era of steam, gears, and clocks, but ultimately gave way to more modern analogy with telephone lines, and then later, the computer. Today we know that neurons are actually just fancy Keurig coffee making machines that mostly produce ATP instead of caffeine. The "K-cups" themselves, the mitochondria, sprinkle this tender like benevolent mob bosses as they cruise the neural byways. Like the cups, they come in variety packs with similar functionality, that expire quickly with use and are ultimately destined to be recycled. The metaphor stalls with real mitochondria in that their actual path to demise is not such predictable, inevitable, timed destruction. In the massively-parallelized Keurig-like neuron, the thousands of mitochondria continually recreate their own unique molecular blends through fusions and fissions (perhaps more aptly called mass equilibrations) which mix and replenish their contents. But there is a little bit more to this picture. As mitochondria move about the axon like huge container ships bidirectionaly distributing goods, these constant mass equilibrations have a net effect not just of transporting, but also sorting and filtering labelled packages from the nucleus. These products include perhaps 1500 nuclear-encoded proteins, and an untold number of nuclear mRNAs that hitch a ride along with the larger membrane-associated mitochondrial entourage. Marija's group found that as they stimulated DRG neurons at up to 50hz, both the number and velocity of mitochondria moving in the anterograde (toward the Merkel disk synapses) was increased. Lower frequency stimulation increased mitochondrial motility as well, but did it equally so in both directions. It was noted that the stationary pool of mitochondria tended to decrease in length, presumably as a result of the fissions needed to fortify the mobile pool. It may be worthwhile to note here that the extent to which mitochondria might actually grow, in the absence of fusion, is difficult to gauge. When regular cells divide, they generally undergo a what might be called a system reboot, and quickly begin to put on mass. In mitochondria, however, fission is not intimately linked with replication of their multiple nucleoid mtDNA strands. The idea that a "stem" population, or a master mitochondrial reservoir, might exist somewhere in a metabolically quiescent (and therefore intact, undamaged state) is appealing, but difficult to prove. A stemlike daughter mitochondrion resulting from some kind of asymmetric division, could in theory remain in the nuclear vicinity where it could readily harvest nuclear instructions and pump out reinforcements. 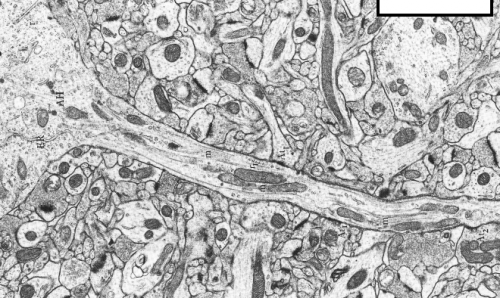 The total mass of mitochondria present in these axons, and the relative change in total mass are important to know because they would give some indication of synaptic demand. Previous observations suggested that worn out mitochondria with collapsed membrane potentials tended to be transported back to the cell for degradation, although new research has now indicated that is not the whole story. Recently, we mentioned the work of Mark Ellisman, which showed mitochondria being transported down axons, extravasated at synapses, and then taken up by other cells. Clearly a theory, perhaps an energy equation, that can take into account all these kinds of behaviors is sorely needed. As Marija observes, it is difficult to imagine that increased activity can rapidly target mitochondria to all of the axon's synapses. Recalling here that for DRG cells, these are actually postsynaptic signal generators of the 200 or more follicles, or Merkel disks in its domain. With redundant ennervation, this might amount to over 1000 branches comprising a meter or so of cutaneous neurite material. One possibility here might be that if spike activity can selectively solvate the cytoplasm of the particular branches that were stimulated, a path of lesser mechanical resistance could, in theory, be transiently maintained. Actual measurements of the heat and motions evolved during spikes suggest that not just axons, but maybe even myelin, can carry some of the energy of the action potential through phase changes. As far as the synapses, it may seem obvious that the presynaptic compliment needs a fair share of ATP to fuel vessicle dynamics, but less obvious is the nature of the demand at the postsynapse. However, as we indicated above, mitochondria have a lot more to offer than just ATP, and this may in part explain their abundance here. Marija notes that many papers on neural energetics take ample account of the energy for restoring membrane potential after spikes, but make only light mention of the ATP demand of axonal transport. ATP generators based on the enzyme GADPH have been shown to take care of motorized vessicle transport in axons, but mitochondria (not surprisingly perhaps) seem to require mitochondrial ATP for transport. We have previously suggested that one organizational principle of nervous systems might be that neurons tend to match the energy sunk into axons, ie. for spikes and transport, with the return on investment that they get at all their synapses. That idea might go a long way towards explaining the observed low release probabilities for many synapses. The close association of spiking activity with synapse-directed mitochondrial translocation is a vindication of many common sense intuitions about the operations of neurons. Phase-changes and pressure waves associated with spikes may provide additional mechanisms whereby untethered mitochondria can progress quickly down an axon. Cooperative, but congested motor protein transporters, plying along crowded microtubule and actin tracks, are the dogmatic means of transport, but proving that they are they only game in town may await better methods. Imaging of the exchange of myosin, kinesin and dynamin motors in mitochondria with more accurate labels may permit better correlation of direction changes to these controllers. Back when neurons were still just simple computers that electrically beeped untold bits to each other over cold axon wires, spikes were not seen as the hierarchical synthesis of every activity in the cell down to the molecular scale that we might say they are today. In other words, spikes were just a summary report of inputs to be integrated with the current state, and passed on. In comprehending the intimate relationships of mitochondria to spikes (and other molecular dignitaries like calcium) we might now more broadly interpret them as synced messages that a neuron sends to itself, and by implication its spatially extended inhabitants. Synapses weigh this information heavily but ultimately, but like the electoral college, fold in a heavy dose of local administration to their output. The sizes and positions within the cell to which mitochondria are deployed can not be idealized or anthropomorphized to be those metrics that the neuron decides are best for itself, but rather what is thermodynamically demanded. Many important experiments might now be cued up to further investigate live mitochondrial dynamics in intact systems. It would be useful to look directly at more traditional axons, like those of motor neurons, and also purely dendritic systems, like those of Purkinje cells. The simplistic "electrotonic" conceptualization of the massive Purkinje tree, for example, seems to make little sense if the informational output of tens of thousands of dendritic synapses is lost by bottlenecking through the severely limited bandwidth of the single primary shaft. A similar bottleneck might be said to exist at the axon, where a single spike train must coordinate thousands of end effectors, many of which make redundant connections on the same target. If instead if we view these neuritic mazes as the proving grounds for the tiny geometrical bundles of membrane-pipelined metabolism we call mitochondria, we may hint at their larger functions. Matching energy supply and demand is critical in the bioenergetic homeostasis of all cells. This is a special problem in neurons where high levels of energy expenditure may occur at sites remote from the cell body, given the remarkable length of axons and enormous variability of impulse activity over time. Positioning mitochondria at areas with high energy requirements is an essential solution to this problem, but it is not known how this is related to impulse conduction in vivo. Therefore, to study mitochondrial trafficking along resting and electrically active adult axons in vivo, confocal imaging of saphenous nerves in anaesthetised mice was combined with electrical and pharmacological stimulation of myelinated and unmyelinated axons, respectively. We show that low frequency activity induced by electrical stimulation significantly increases anterograde and retrograde mitochondrial traffic in comparison with silent axons. Higher frequency conduction within a physiological range (50 Hz) dramatically further increased anterograde, but not retrograde, mitochondrial traffic, by rapidly increasing the number of mobile mitochondria and gradually increasing their velocity. Similarly, topical application of capsaicin to skin innervated by the saphenous nerve increased mitochondrial traffic in both myelinated and unmyelinated axons. In addition, stationary mitochondria in axons conducting at higher frequency become shorter, thus supplying additional mitochondria to the trafficking population, presumably through enhanced fission. Mitochondria recruited to the mobile population do not accumulate near Nodes of Ranvier, but continue to travel anterogradely. This pattern of mitochondrial redistribution suggests that the peripheral terminals of sensory axons represent sites of particularly high metabolic demand during physiological high frequency conduction. As the majority of mitochondrial biogenesis occurs at the cell body, increased anterograde mitochondrial traffic may represent a mechanism that ensures a uniform increase in mitochondrial density along the length of axons during high impulse load, supporting the increased metabolic demand imposed by sustained conduction.